Koko Company Ticket Accent Pillows... "inspired by transportation tickets - let's travel!" Ticket Accent Pillows are distinctive, unique, vintage designs to be enjoyed for years to come. "At Koko Company everything begins with the fabric...a small tribute to the subtlety & perfection of natural fibers." Ticket Accent Pillows are hand screen printed on unbleached cotton, featuring a back center opening with a tie closure...no buttons, no zippers. The removable insert is of fitted polyester. Unparalleled quality & workmanship...whimsical, vibrant, luxury designer accent pillows. Create a fresh new look & the final touch to your decorating motif with this collection of Ticket accent pillows. 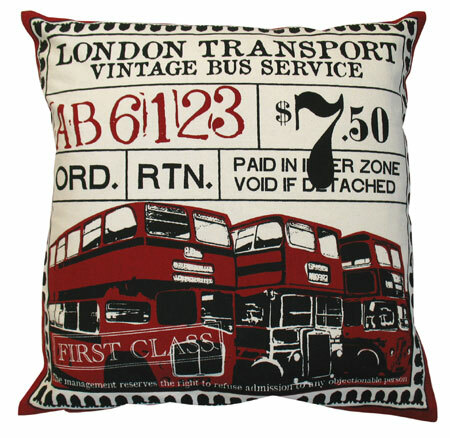 Koko Company Ticket Accent Pillows / Red & black with double- decker bus ticket design. Machine wash cold / Gentle cycle. Made with pride in India.